Not to be confused with Ammonite. Amniotes are tetrapods (descendants of four-limbed and backboned animals) that are characterised by having an egg equipped with an amnion, an adaptation to lay eggs on land rather than in water as the anamniotes (including frogs) typically do. Amniotes include synapsids (mammals along with their extinct kin) and sauropsids (reptiles and birds), as well as their ancestors, back to amphibians. Amniote embryos, whether laid as eggs or carried by the female, are protected and aided by several extensive membranes. In eutherian mammals (such as humans), these membranes include the amniotic sac that surrounds the fetus. These embryonic membranes and the lack of a larval stage distinguish amniotes from tetrapod amphibians. 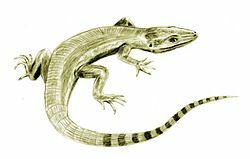 The first amniotes, referred to as "basal amniotes", resembled small lizards and evolved from the amphibian reptiliomorphs about 312 million years ago, in the Carboniferous geologic period. Their eggs could survive out of the water, allowing amniotes to branch out into drier environments. The eggs could also "breathe" and cope with wastes, allowing the eggs and the amniotes themselves to evolve into larger forms. Zoologists characterize amniotes in part by embryonic development that includes the formation of several extensive membranes, the amnion, chorion, and allantois. Amniotes develop directly into a (typically) terrestrial form with limbs and a thick stratified epithelium (rather than first entering a feeding larval tadpole stage followed by metamorphosis, as amphibians do). In amniotes, the transition from a two-layered periderm to a cornified epithelium is triggered by thyroid hormone during embryonic development, rather than by metamorphosis. The unique embryonic features of amniotes may reflect specializations for eggs to survive drier environments; or the massive size and yolk content of eggs may have evolved to allow the direct development of the embryo to a larger size. Features of amniotes evolved for survival on land include a sturdy but porous leathery or hard eggshell and an allantois evolved to facilitate respiration while providing a reservoir for disposal of wastes. Their kidneys and large intestines are also well-suited to water retention. Most mammals do not lay eggs, but corresponding structures develop inside the placenta. The ancestors of true amniotes, such as Casineria kiddi, which lived about 340 million years ago, evolved from amphibian reptiliomorphs and resembled small lizards. At the late Devonian mass extinction (360 million years ago), all known tetrapods were essentially aquatic and fish-like. Because the reptiliomorphs were already established 20 million years later when all their fishlike relatives were extinct, it appears they separated from the other tetrapods somewhere during Romer's gap, when the adult tetrapods became fully terrestrial (some forms would later become secondary aquatic). The modest-sized ancestors of the amniotes laid their eggs in moist places, such as depressions under fallen logs or other suitable places in the Carboniferous swamps and forests; and dry conditions probably do not account for the emergence of the soft shell. Indeed, many modern-day amniotes require moisture to keep their eggs from desiccating. Although some modern amphibians lay eggs on land, all amphibians lack advanced traits like an amnion. 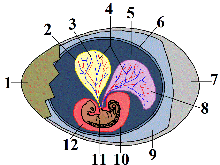 The amniotic egg formed through a series of evolutionary steps. 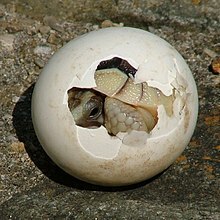 After internal fertilization and the habit of laying eggs in terrestrial environments became a reproduction strategy amongst the amniote ancestors, the next major breakthrough appears to have involved a gradual replacement of the gelatinous coating covering the amphibian egg with a fibrous shell membrane. This allowed the egg to increase both its size and in the rate of gas exchange, permitting a larger, metabolically more active embryo to reach full development before hatching. Further developments, like extraembryonic membranes (amnion, chorion, and allantois) and a calcified shell, were not essential and probably evolved later. It has been suggested that shelled terrestrial eggs without extraembryonic membranes could still not have been more than about 1 cm (0.4 inch) in diameter because of diffusion problems, like the inability to get rid of carbon dioxide if the egg was larger. The only way for the eggs to increase in size would be to develop new internal structures specialized for respiration and for waste products. As this happened, it would also affect how much the juveniles could grow before they reached adulthood. Fish and amphibian eggs have only one inner membrane, the embryonic membrane. The amniote egg evolved new internal structures to accommodate gas exchange between the embryo and the atmosphere and to deal with wastes. After these structures developed, further adaption allowed amniotes to lay bigger eggs and to breed in drier habitats. The evolution of larger eggs opened up for larger offspring and consequently larger adults, with those who adapted to a diet of fish and other aquatic animals getting bigger than the terrestrial tetrapods. Further growth for the latter, however, was limited by their position in the terrestrial food-chain, which was restricted to level three and below, with only invertebrates occupying level two. Amniotes would eventually experience adaptive radiations when some species evolved the ability to digest plants and new ecological niches opened up, permitting larger body-size for herbivores, omnivores and predators. While the early amniotes resembled their amphibian ancestors in many respects, a key difference was the lack of an otic notch at the back margin of the skull roof. In their ancestors, this notch held a spiracle, an unnecessary structure in an animal without an aquatic larval stage. There are three main lines of amniotes, which may be distinguished by the structure of the skull and in particular the number of temporal fenestrae (openings) behind each eye. In anapsids, the ancestral condition, there are none, in synapsids (mammals and their extinct relatives) there is one, and most diapsids (including birds, crocodilians, squamates, and tuataras), have two. Turtles were traditionally classified as anapsids because they lack fenestrae, but molecular testing firmly places them in the diapsid line of descent - they therefore secondarily lost their fenestrae. Post-cranial remains of amniotes can be identified from their Labyrinthodont ancestors by their having at least two pairs of sacral ribs, a sternum in the pectoral girdle (some amniotes have lost it) and an astragalus bone in the ankle. Amniota was first formally described by the embryologist Ernst Haeckel in 1866 on the presence of the amnion, hence the name. A problem with this definition is that the trait (apomorphy) in question does not fossilize, and the status of fossil forms has to be inferred from other traits. Archaeothyris, one of the most basal synapsids, first appears in the fossil records about 306 million years ago. 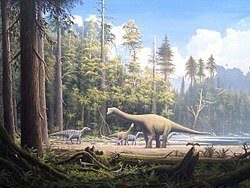 By the Mesozoic, 150 million years ago, sauropsids included the largest animals anywhere. Shown are some late Jurassic dinosaurs and the early bird Archaeopteryx perched on a tree stump. This rather orderly scheme is the one most commonly found in popular and basic scientific works. It has come under critique from cladistics, as the class Reptilia is paraphyletic—it has given rise to two other classes not included in Reptilia. A different approach is adopted by writers who reject paraphyletic groupings. One such classification, by Michael Benton, is presented in simplified form below. With the advent of cladistics, other researchers have attempted to establish new classes, based on phylogeny, but disregarding the physiological and anatomical unity of the groups. Unlike Benton, for example, Jacques Gauthier and colleagues forwarded a definition of Amniota in 1988 as "the most recent common ancestor of extant mammals and reptiles, and all its descendants". As Gauthier makes use of a crown group definition, Amniota has a slightly different content than the biological amniotes as defined by an apomorphy. The cladogram presented here illustrates the phylogeny (family tree) of amniotes, and follows a simplified version of the relationships found by Laurin & Reisz (1995). The cladogram covers the group as defined under Gauthier's definition. The inclusion of Testudines within Parareptilia is unsupported by more recent morphological phylogenetic studies, which placed turtles firmly within diapsids. All molecular studies have also strongly upheld the placement of turtles within diapsids. Within diapsids, some place turtles within Archosauria, or, more commonly, as a sister group to extant archosaurs, though an analysis conducted by Lyson et al. (2012) recovered turtles as the sister group of lepidosaurs instead. ^ a b c d e Jason D. Pardo; Matt Szostakiwskyj; Per E. Ahlberg; Jason S. Anderson (2017). "Hidden morphological diversity among early tetrapods". Nature. 546 (7660): 642–645. doi:10.1038/nature22966. PMID 28636600. ^ Benton, Michael J. (1997). Vertebrate Palaeontology. London: Chapman & Hall. pp. 105–109. ISBN 978-0-412-73810-4. ^ Alexander M. Schreiber; Donald D. Brown (2003). "Tadpole skin dies autonomously in response to thyroid hormone at metamorphosis". Proceedings of the National Academy of Sciences. 100 (4): 1769–1774. doi:10.1073/pnas.252774999. PMC 149908. PMID 12560472. ^ "the_mid_palaeozoic_biotic_crisis - Ocean and Earth Science, National Oceanography Centre Southampton - University of Southampton". ^ Cunningham, B.; Huene, E. (Jul–Aug 1938). "Further Studies on Water Absorption by Reptile Eggs". The American Naturalist. 72 (741): 380–385. doi:10.1086/280791. JSTOR 2457547. ^ Michel Laurin (2004). "The evolution of body size, Cope's rule and the origin of amniotes". Systematic Biology. 53 (4): 594–622. doi:10.1080/10635150490445706. PMID 15371249. ^ Romer A S and Parsons T S (1985) The Vertebrate Body. (6th ed.) Saunders, Philadelphia. ^ Carroll, R. L. (1988), Vertebrate Paleontology and Evolution, WH Freeman & Co.
^ Benton, M.J. (2004). Vertebrate Paleontology. Blackwell Publishers. xii–452. ISBN 978-0-632-05614-9.